Unilever Caribbean jumped $2.48 to $29.23, trading 947 shares and West Indian Tobacco climbed $1.66 to $88.49, exchanging 6,826 shares on the Trinidad & Tobago Stock Exchange on Monday, and pushed the market higher. At the close, 16 securities traded against 14 on Friday as 5 advanced, 2 declined and 9 remained unchanged. 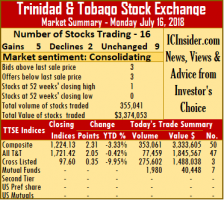 The Composite Index advanced 2.31 points to 1,224.13, the All T&T Index gained 2.05 points to 1,721.42 and the Cross Listed Index put on 0.35 points to close at 97.60. Trading ended with 355,041 shares at a value of $3,374,053, compared to 255,565 shares on Friday valued at $8,523,843. IC bid-offer Indicator| At the end of trading, the Investor’s Choice bid-offer indicator reading shows market sentiment with 3 stocks ending with higher bids than the last selling prices and 3 with lower offers. Gains| First Citizens finished trading at $35 after rising 9 cents, in exchanging 1,762 shares, NCB Financial Group closed with an increase of 5 cents and settled at $5.40, trading 275,542 shares and Republic Financial Holdings gained 3 cents and concluded trading at a 52 weeks’ high of $102.80, after 912 shares changed hands. Losses| Clico Investments shares fell 20 cents and ended at $20.30, with 1,980 stock units changing hands and Prestige Holdings lost 1 cent and completed trading at $10, with 169 units. Firm Trades| Guardian Holdings completed trading at $16.51, with 400 units, JMMB Group exchanged 60 shares at $1.85, Massy Holdings concluded trading at $47, after exchanging 418 shares, National Enterprises ended at $9.55, with 2,500 stock units changing hands, One Caribbean Media closed at $12, after exchanging 44,000 shares, Point Lisas ended at $3.81, with 1,873 stock units changing hands, Scotiabank completed trading of 2,129 units at $65.10, Trinidad & Tobago NGL ended at $29.75, with 11,035 stock units changing hands and Trinidad Cement completed trading of 4,488 units at $2.95.